People diagnosed with anxiety disorders like panic disorder often experience uncomfortable physical symptoms, including sweating, accelerated heart rate, shaking, and trembling. Given the severity of these physical symptoms, it's not surprising that many people with panic disorder seek emergency medical care—one 2016 study reported that there were 1,247,000 anxiety-related ER visits annually. However, due to the complexity of the condition, the wide range of symptoms, and the similarity to other illnesses, panic disorder is often misdiagnosed in emergency rooms. Hopefully, the following summary of common physical symptoms and co-occurring conditions associated with panic disorder and anxiety will make them easier to diagnose. 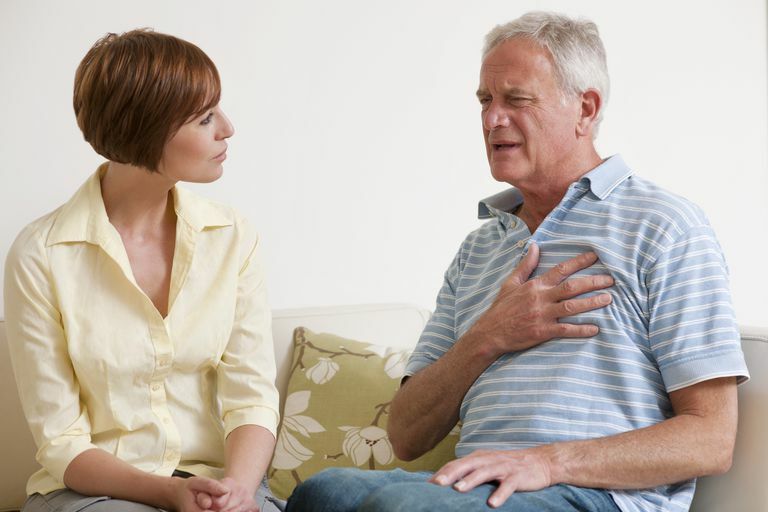 Chest pain is one of the most frightening physical symptoms of panic attacks. This is also the symptom that most often sends panic disorder sufferers to the emergency room. When chest pain occurs during a panic attack, it's not uncommon for the person to believe he or she is experiencing a medical emergency, such as a heart attack. Fortunately, panic attacks are typically not life-threatening. However, only a doctor or other medical professional is qualified to make a proper diagnosis and determine if a person’s chest pain is simply a symptom of a panic attack or is actually caused by a separate medical condition. Many people report that they find it difficult to breathe during a panic attack. Some describe it as a suffocating or smothering feeling; others say it's more like a choking sensation. Regardless of how it's described, shortness of breath can be a frightening experience—one that may lead to a fear of fainting or even death. This in turn only heightens panic and anxiety. Even though shortness of breath can be scary and upsetting, it's often easily managed through the use of coping techniques, such as deep breathing exercises. People with panic disorder are more prone to experiencing frequent headaches. Additionally, those diagnosed with panic disorder have also been found to suffer from the severe types of headaches known as migraines. Many people with panic disorder have reported that headaches and migraines often develop right after a panic attack. Treatment options for panic disorder and co-occurring headaches and migraines are available. Some medications used to treat panic disorder have been found to be a safe and effective way to also treat co-occurring headaches. However, some medications for panic disorder may actually be contributing to headaches. A doctor or other medical professional will be able to create a treatment plan to help you manage both conditions. Irritable bowel syndrome (IBS) is a digestive disorder estimated to affect approximately 20 percent of U.S. adults. The symptoms of IBS include bloating, frequent stomachaches, diarrhea, cramping, and constipation. Studies have found that IBS is more prevalent among people with anxiety disorders, especially panic disorder. Both IBS and panic attacks involve a great deal of anticipatory anxiety, feelings of embarrassment, and avoidance behaviors. IBS and panic disorder have both been found to respond favorably to medication, psychotherapy, or a combination of these two treatment options. Experiencing frequent feelings of fear, worry, and anxiety can impact the body by contributing to muscle pain and tightness. Muscle tension is a common problem for people with panic disorder. Typically, muscles become tense during a panic attack and can cause feelings of stiffness throughout the body, long after the attack has subsided. Muscle pain and discomfort can often be managed through relaxation techniques. Common activities that can help calm and relax the body include breathing exercises, progressive muscle relaxation, and visualization. There are many self-help books that provide examples and instructions on these techniques. Yoga is an activity that includes many aspects of relaxation with the additional benefits of exercise for panic disorder. Yoga classes can be found at local studios, gyms, and community centers. Chronic worry, simply put, is exhausting, so it's typical for people with anxiety disorders like panic disorder—which often creates a cycle of fear about having another panic attack—to be fatigued. But sometimes the worry or other physical symptoms of anxiety make it difficult either to fall or stay asleep. In the short-term, this can take a toll on other aspects of physical and psychological well-being. For people experiencing even mild sleep disruptions, anxiety treatment is likely to involve changes to the bedtime routine. Belleville, G. Folds-Busque, G., & Marchand, A. Characteristics of panic disorder patients consulting an emergency department with noncardiac chest pain. Primary Psychiatry, 35-42, 2010. Bourne, E. J. The Anxiety and Phobia Workbook, 2011. Tyra Dark, Ph.D., M.A., Heather A. Flynn, Ph.D., George Rust, M.D., Heidi Kinsell, Ph.D., Jeffrey S. Harman, Ph.D. Epidemiology of Emergency Department Visits for Anxiety in the United States: 2009–2011. Psychiatric Services. Published Online:17 Oct 2016.